Last major update issued on June 24, 2005 at 04:10 UTC. The geomagnetic field was unsettled to severe storm on June 23. 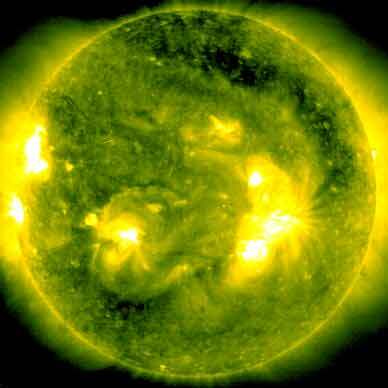 Solar wind speed ranged between 332 and 566 km/sec under the influence of a high speed stream from CH171. Solar flux measured at 20h UTC on 2.8 GHz was 77.5. The planetary A index was 48 (STAR Ap - based on the mean of three hour interval ap indices: 47.5). Three hour interval K indices: 44755443 (planetary), 44655433 (Boulder). June 21-23: No obvious fully or partly Earth directed CMEs were observed in available LASCO images. 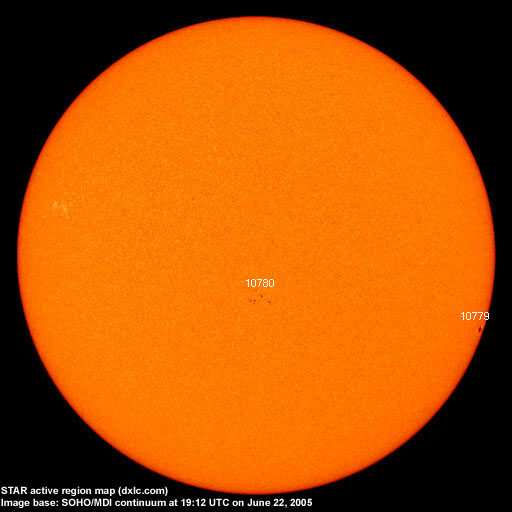 The geomagnetic field is expected to be quiet to minor storm on June 24 due to a high speed stream from CH171 and quiet to unsettled on June 25-26. Long distance low and medium frequency (below 2 MHz) propagation along east-west paths over high and upper middle latitudes is very poor. Propagation along long distance north-south paths is poor. Trans Atlantic propagation conditions are normally monitored every night on 1470 kHz. Dominant station tonight: Radio Cristal del Uruguay with a weaker than usual signal. Only a few stations were audible on other frequencies with the best signal from Rádio Metropolitana on 930 kHz.